It might seem odd to some other LHC physicists, to hear me say that I love gluons. To someone doing a “search”, such as looking for evidence of the Higgs boson, or supersymmetry, or extra dimensions, It is a little bit like an archeologist saying he loves sand. An example of this: a person is looking for a certain boson that is expected to be produced prolifically (say ten a day) at the LHC but then realises that the rate of gluon production is a trillion times higher and looks almost exactly the same most of the time. You could be forgiven for being a bit pissed off with the gluon. Perhaps even resentful. Gluons are thought to hold particles together, hence the name. They sprung up because we figured out about quarks and we needed to work out how they could be forced to stay in the same piece of space like they do. Briefly- a proton (the things we collide at the LHC) contains three bound quarks. Two of these are up quarks, one of them is a down quark. Their electric charges are ⅔,⅔ and -⅓. If you are a dork will you notice that these add up to +1: the charge of the proton. What on earth is binding these quarks together? It certainly isn’t the same ‘force’ that is holding the atom together (i.e. holding the electron, with charge -1 in orbit around the proton). That force is the beauteous electromagnetism, mediated by the photon. One thing we all know about electromagnetism is that opposites attract. We notice that at primary school when we are given bar magnets to play with, while the teacher gets on with her work as if there is nothing wrong and she has not just given you something which is clearly magic. Opposites attract means that like signs repel one another. Pretty strongly. This means that the two up quarks in a proton must be repelling each other. So, there must be another force, something that only works on quarks inside a proton (the small-scale)* and not on bar magnets in primary school (the large-scale). The force of nature that is binding the quarks together is “the strong force”. The strong force is like the genie in the bottle: AWESOME POWER, itty bitty living space. This could not be more different from the photon, which occupies the whole universe. The mediator of the strong force was named the gluon. A problem existed though. If there was a strong force holding these quarks together, then it had to have an associated particle, which was named the gluon for its knack of gluing the quarks together. But the gluon was not observed. Moreover, quarks were not observed either. We never actually observed quarks or gluons, we only observed composite particles that we supposed must be made of two or three quarks because they appeared to contain two or three somethings and the somethings seemed to fit very well the things that Murray Gell Mann called quarks. Even when these composite particles were smashed to bits we did not see quarks, we saw only other composites. Very many of them. Just like the naked quark, it seemed that the gluon was not observable, but why? The answer started to come when another problem was thunk about. The Δ++: pronounced “Delta plus plus”and apparently made of three identical quarks. No problem, except it violated the exclusion principle: quarks are fermions, and fermions cannot be in identical states. Murray Gell Mann and Harald Fritzsch went off for a little think and a chat, then came back and said, that’s fine- quarks come in three colors**. This would be absolutely pathetic if I said it, but this is Gell Mann and Fritzsch we are talking about, and they have already by this time given us huge reason to think they may actually be geniuses. Also, the nature of the physicist is such that the number one hot activity for all theorists would be to react to such a claim by pouring a hundred percent of their energy into proving it wrong. This didn’t happen- the color thing actually seemed to explain everything quite nicely. This is quantum chromodynamics: QCD. It is Murray’s way to use his imagination. There has to be something different about these quarks, he thought. He had already used up the generally used ways of being different, such as electric charge and mass and spin and flavor. He had also concocted new ways of being different by combining these old ways in different ways, making the isospin and hypercharge that he used to construct the theory of quarks. But this was a greater leap, really. Photons, of electromagnetic field fame, will couple to any particle that has electric charge. they have no charge themselves, they just like being around it. 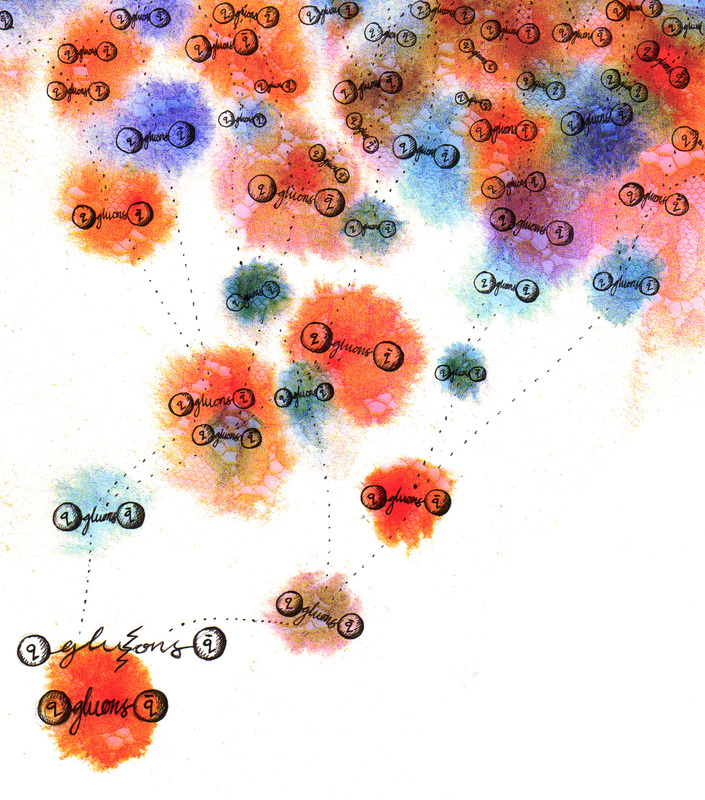 Gluons, of the strong field, only couple to quarks. They ignore everything else. You don’t get a gluon messing about with an electron. So perhaps there is a “quark charge”. This is it: color. It is a quark-charge. You could call it quark charge, but why do that when you can give it a name that allows intuitive calculations? Color charge has three faces (red, blue and green), not two like electric charge (positive and negative), but three. This means that the Δ++ can exist. Does this explain why we don’t see quarks on their own? Yes, it does, if there is a rule that states that there can be no `color singlets’. All objects have to be colorless and there are two ways of achieving this: red+blue+green = colorless (all baryons) and red+red = colorless providing one of them is an anti-particle of the other. For this to work, gluons must also carry color. Taking a pion as an example, all we can say is that the up and anti-up quarks inside the pion must be the same color at all times. There is a gluon field holding them together, and this gluon field carries the color between them: red going one way, blue another, both are blue, blue going one way, green another, both are green. That boy had some imagination. 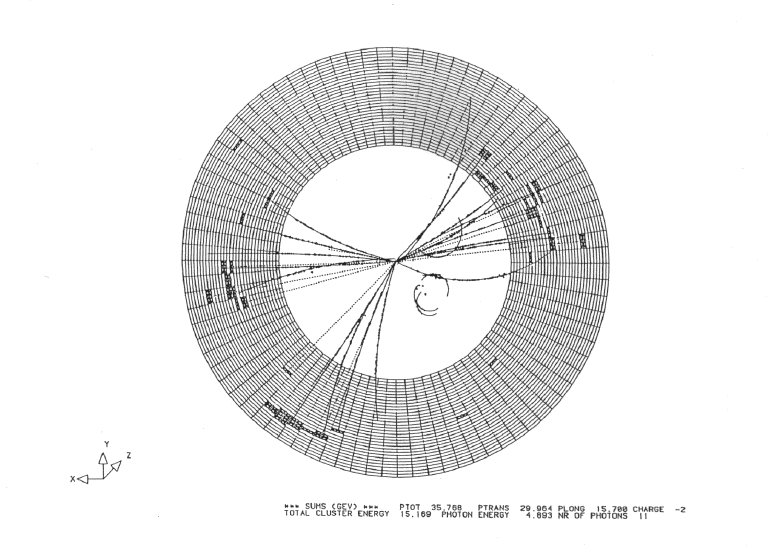 The gluon was observed for the first time in 1979 by physicists working on the experiments of the PETRA accelerator at DESY. Experimentalists had been observing `dijets’ (two jets) for some time: the electron and positron would collide and annihilate, freeing up enough energy to let a quark – antiquark pair claw its way out of the vacuum. This quark-antiquark pair are observed as sprays of energy, `jets’, in the detector. They would not be nice clean tracks, as you would get if an electron positron pair were produced, because electrons radiate photons but quarks radiate gluons. And put simply, gluons make much more of a mess than photons do. The theory (QCD) predicted that in a certain fraction of these diet events, one of the quarks would radiate a gluon with enough energy to form its own jet. Hence the experimenters looked for ‘three-jet events’, and that is what they found. What are the implications of QCD for an environment like that inside the ATLAS detector just after two protons have collided at close to the speed of light? The answer to this is the thing I have spent countless hours thinking about and trying to measure. Jets are what happens when the release of energy in a collision results in the production of partons (quarks and gluons) that are flying out into the detector, momentarily liberated from the confines of the protons or the monotony of the vacuum. But quarks that are made together, stick together. They will be attached to one another by the gluon color field always. As they move further away from one another, the gluon field does not get weaker- it keeps its strength no matter how far apart the quarks get. Admittedly, when the quarks reach some tiny distance from one another, the gluon ‘strings’ (absolutely nothing to do with string theory) break into new quark-antiquark pairs. But these remain ‘color-connected’ to one another, as well as to the initial quark-antiquark pair. This is what we think is going on between the two quarks. We see it as energy deposits. As we move outwards from the collision point and the quarks get further apart, the spread of energy covers a larger area. This is why jets are sometimes though of as cones of energy. I see them as more like trees, but that is for next time. *also on protons inside an atom, but this is a sort of middle-scale and is a bit different from the small-scale strong force. **I say color rather than colour, because they are not the same thing. This entry was posted in Particle Physics, Physics, Science and tagged DESY, LHC. Bookmark the permalink.